We need to schedule the two load plans for execution one after the other. 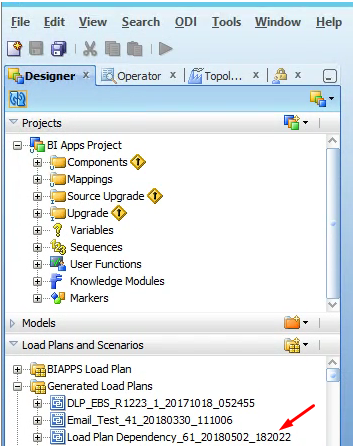 And the second load plan has components (tables to be loaded) which are derived based on the first load plan execution. Load Plan 1 is scheduled at 9:00 AM IST and takes 3 hours to complete. Load Plan 2 is scheduled at 12:30 PM IST which will be kicked off once the Load Plan 1 is completed. Let’s suppose we have encountered a failure in Load Plan 1 execution which was not monitored. Meanwhile, Load Plan 2 has been kicked off and as Load Plan 2 has dependent objects to be loaded from the execution of Load Plan 1, there will be data discrepancy. Instead, if we setup Load Plan 2 to run in a sequential manner right after the completion of Load Plan 1, we can prevent the data discrepancy issue permanently. Let’s look in to how we can overcome this issue. Setting up Load Plan 2 to run in a sequential manner right after the completion of Load Plan 1 will help overcome the issue. 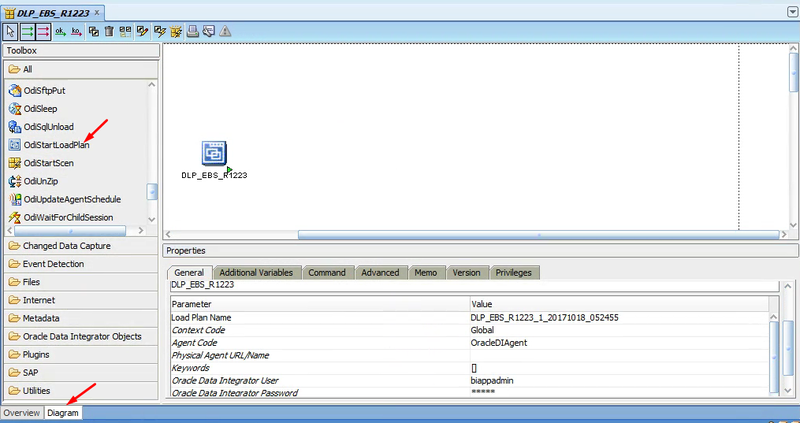 In ODI, we can implement it using an inbuilt Oracle component in the Package Toolbox. Let’s dive into implementing Load Plan dependencies between the two different load plans. “DLP_EBS_R1223” load plan (Load Plan 2) shown above needs to be run right after “Load Plan Dependency” load plan (Load Plan 1) execution is completed. This should be done immediately rather than monitoring the load plan, waiting for it to complete and kicking off the next load plan manually. As we need to set the dependency between the two load plans, we will follow the steps as shown in the example below. This example is based on an OBIA environment and can be implemented in standalone ODI as well. Create a Package with “OdiStartLoadPlan” component from the toolbox, provide the required details. 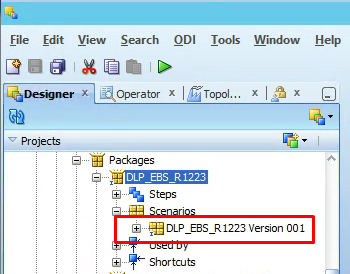 As we finish setting up the dependency between the Load Plans, once the Load Plan Dependency” reaches the last step, DLP_EBS_R1223 is initiated automatically and the load plan execution begins. We hope that this blog post has helped you understand how to setup dependencies between Load Plans in ODI. This will help prevent data discrepancy between the dependent tables present in the load plans. Migrating this to a new environment is similar to individual mappings in any OBIA project. If you have to customize the underlying objects/any reordering of the objects in the dependent load plan, make sure to update the schedule which ensures that the latest code is picked as part of the scheduling process. Chaithanya Kumar Taduvai is a Team Lead specializing in OBIA, ODI, Informatica and OBIEE with over 8 years of experience in Data Warehousing. 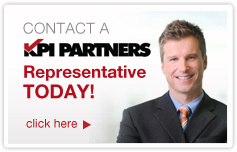 He has implemented BI Apps solutions including installations and configurations for Financials, Procurement & Spend, and Supply Chain Management on Oracle EBS source systems.